Nearly one-third of all adults will meet criteria for an alcohol use disorder at some point in their lives. Many people begin to use alcohol as a way to escape their problems or feel more relaxed. Over the long term, alcohol abuse can cause serious health problems including liver cirrhosis, cancer, and cardiovascular disease. Signs of alcoholism include losing interest in activities, problems at school or work, erratic behavior, and difficulties with relationships. Alcohol withdrawal is potentially fatal and should be medically supervised. Signs of alcohol overdose include confusion, hypothermia, pale or blue-tinged skin, loss of consciousness, and slowed breathing. Ethanol, or “drinking alcohol,” is the primary psychoactive or intoxicating component in all beers, wines, and various types of liquors.15 Most people consume alcohol in beverage form. It is rapidly absorbed into the bloodstream from the stomach and the small intestine. 1.5 ounces (i.e., one shot) of 80 proof distilled liquor or spirits (e.g., gin, vodka, rum, or whiskey). Alcohol is a central nervous system depressant. In general, brain activity slows down when under the influence of alcohol, leading to impairment of a number of physiologic processes. Learn more about alcohol effects. Drinking more or for longer than you originally planned. Trying unsuccessfully to cut back on your drinking on more than one occasion. Getting sick or needing a lot of time to get over the effects of drinking. Feeling an intense craving to have a drink. 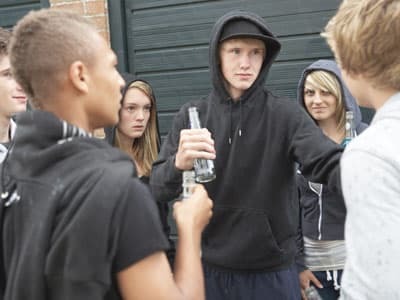 Drinking or recovering from drinking interferes with your ability to take care of your home or your family or has caused problems at work or school. Consistent alcohol use can quickly lead to the development of alcohol dependence and, ultimately, the patterns of compulsive use associated with alcohol addiction. Some people use alcohol as a way to cope with bad feelings or life’s difficulties, because alcohol offers a fast and easy way to feel good. Alcohol can even help normally shy individuals feel more comfortable in social situations. It can be difficult to recognize whether your drinking is problematic. 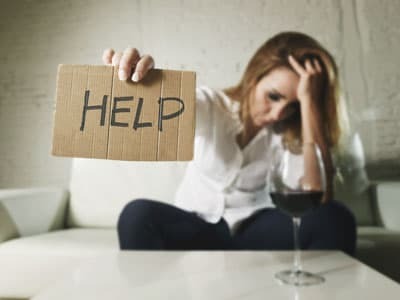 Generally, when you begin to crave alcohol or regularly use it to escape bad feelings or to cope with life’s challenges, you may have a problem. Alcohol addiction can occur as the result of interconnected factors. These can include a genetic predisposition, your social environment, and your emotional health. Addiction is fueled, in part, by both physiological and psychological dependence on alcohol. Being physiologically dependent means that the circuitry in your brain has been altered so that you experience withdrawal symptoms when you stop drinking. Psychological dependency occurs when you believe that you must continue to use the substance in order to function every day. 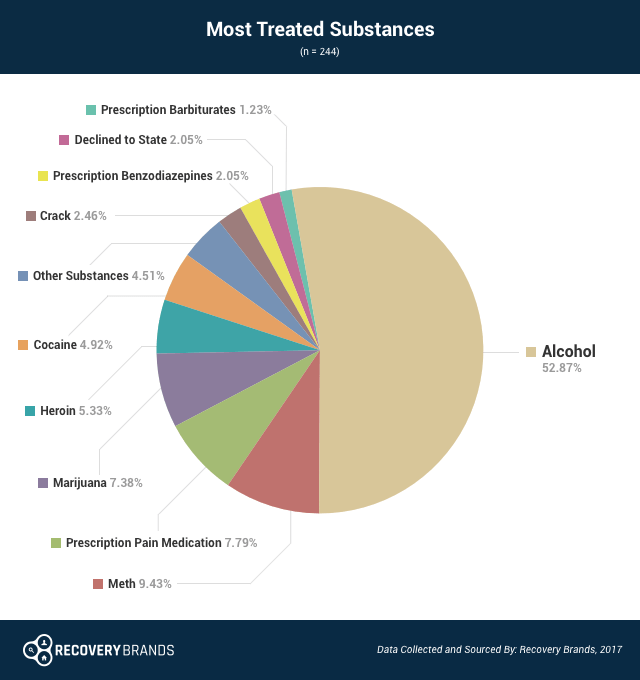 Ethanol (alcohol) is the top substance of abuse among those who attend treatment, according to a Recovery Brands survey in 2017. About 69% of respondents underwent treatment for alcohol abuse, and 52.87% of people that took the survey reported that alcohol abuse treatment was their most common recovery goal. Who Answers? to join many others in recovery and end the cycle of abuse. Binge drinking is having 5 or more alcoholic drinks in the same sitting at least once in a 30-day period. Having a few drinks socially is not necessarily a problem. But individuals who consume excessive amounts of alcohol in a single sitting may meet the definition of binge drinking. Learn more about binge drinking. Alcohol withdrawal can be fatal, and heavy drinkers attempting to quit should seriously consider medical supervision in case symptoms become severe. Rapid and/or irregular heart rate. Learn more about alcohol withdrawal. Hypothermia (i.e., excessively low body temperature). Slowed respiratory and heart rate. If you or someone you know is suffering from alcohol overdose, call 911 immediately or visit the local emergency room. Learn more about alcohol overdose. Alcohol poisoning can happen to anyone at any age. Amy Winehouse, an extremely talented singer and songwriter famous for her hits “Rehab,” “Back to Black,” and “Valerie,” died tragically in 2011 at the young age of 27 from an overdose on alcohol. Inpatient or residential rehab centers. You stay at the treatment facility while participating in a program that includes detoxification, group and individual therapy, and 12-step meetings. Outpatient rehab centers. You continue to live at home while visiting a treatment center for a few hours on certain days of the week. 12-step programs. You meet with others in recovery to support each other and work with a sponsor on completing a series of recovery steps. Alcoholics Anonymous is the 12-step program for alcohol addiction. Dual diagnosis treatment facilities. You attend a specialized treatment program that helps you overcome an addiction and a co-occurring mental health problem[/link]. Learn more about treatment for alcohol addiction. The program type (inpatient vs. outpatient). What kind of insurance coverage you have. If you have insurance. Call 1-888-319-2606 Who Answers? to learn more about what your insurance will cover and what your treatment options are based on your insurance. If you don’t have insurance. Contact the Substance Abuse and Mental Health Services Administration’s toll-free helpline to get assistance finding a rehab program that helps those without insurance. If you or someone you love is struggling with alcohol abuse, call 1-888-319-2606 Who Answers? to speak with a treatment support specialist about alcohol rehabilitation options.
. Nasqvi NH, Morgenstern J. Cognitive neuroscience approaches to understanding behavior change in alcohol use disorder treatments. Alcohol Res 2015;37:29-38.
. Jones JD, Comer SD. A review of pharmacogenetic studies of substance-related disorders. Drug Alcohol Depend 2015;1521-14.
. American Psychiatric Association. Diagnostic and Statistical Manual of Mental Disorders, 5th ed. Arlington, VA, American Psychiatric Publishing, 2013.
. National Institute on Alcohol Abuse and Alcoholism. Beyond Hangovers: Understanding alcohol’s impact on your health.
. National Institute on Alcohol Abuse and Alcoholism. Alcohol and Your Health.
. National Institute on Drug Abuse. Alcohol.
. Naimi TS, Brewer RD, Mokdad A, Clark D, Serdula MK, Marks JS. Binge drinking among US adults. JAMA 2003;289(1):70-75.
. Center for Behavioral Health Statistics and Quality. (2016). Results from the 2015 National Survey on Drug Use and Health: Detailed Tables. Substance Abuse and Mental Health Services Administration, Rockville, MD.
. National Institute on Alcohol abuse and Alcoholism. (2016). Alcohol Facts and Statistics.
. Ethyl alcohol. (2015). Encyclopaedia Britannica.
. National Institute on Alcohol Abuse and Alcoholism. What Is a Standard Drink?
. National Institute on Alcohol Abuse and Alcoholism. Exploring Treatment Options for Alcohol Use Disorders.
. National Institute on Alcohol Abuse and Alcoholism. Drinking Levels Defined.
. Centers for Disease Control and Prevention. (2015). Fact Sheets – Binge Drinking. .U.S. National Library of Medicine. (2015). Medline: Ethanol Poisoning.
. National Institute on Alcohol Abuse and Alcoholism. Alcohol Use Disorder.
. National Institutes of Health. NIH study finds alcohol use disorder on the increase. Press release, June 3, 2015.